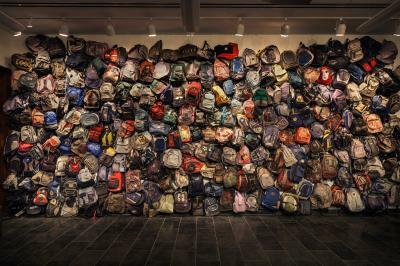 Opening Reception: Friday, May 1, 5:30 – 8:30 p.m.
Over 300 backpacks, water bottles, border restraints and other objects left behind by undocumented migrants on their journey into the United States form the basis of this exhibition exploring the human experience of crossing the U.S./Mexico border. Video and images created on location along the Arizona border ask the viewer to consider the complexities of the found objects. This exhibition is a collaboration between photographer Richard Barnes, artist/curator Amanda Krugliak and anthropologist Jason De Leόn. It was originally presented at the Institute of the Humanities Gallery, University of Michigan Ann Arbor. The ASU Art Museum presentation is supported by the Helme Prinzen Endowment.